During the months of June and July, Blue Sky bade a tearful farewell to two of our older children that have been at Blue Sky for a few years. Qian Yin has been in Blue Sky's care for the past 4 years. She was born with spinal muscular atrophy and is wheel chair bound. She has been undergoing physical therapy and can now walk a few steps with assistance. Ziwen was with us for about 1.5 years. He underwent 2 surgeries while in our care, and was an active and happy child. He is pictured on the left with MinYuan, reading a letter from his adoptive parents. 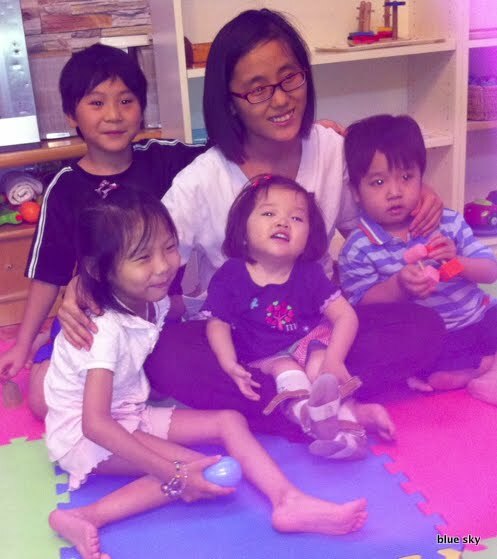 We wish both QianYin and Ziwen the best with their new families! On the right - Xiao Pei (house manager of Blossom House) & the older kids.